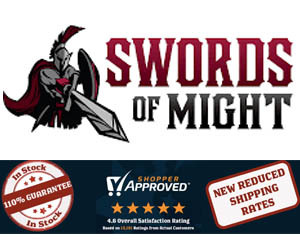 This review of Darksword Armories Knights Templar sword is a good example of what this Canadian based sword making company specializes in: seriously tough hand forged medieval beaters! 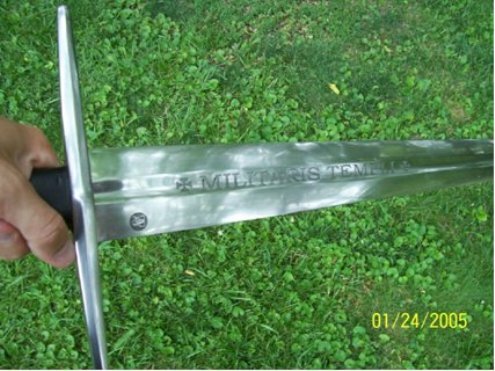 Total length, 46.5" with a 36" blade that is 2 wide inches at the base. Weight 4 Lbs 7 oz.. 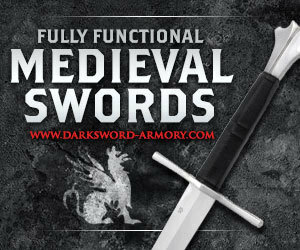 The sword is full tang, oil hardened and hand forged in Canada the old fashioned way - one at a time!! 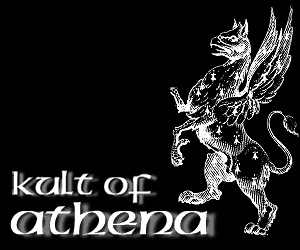 "Classified as type Xa or XI , this is one of the most significant two handed weapons of the medieval period. 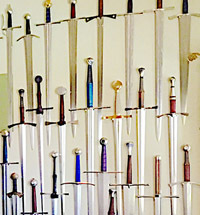 Numerous two handed swords with slight variations were found through Europe, establishing a general conformity and a pattern of influence among smiths of the time." This is my second sword from Darksword armory. 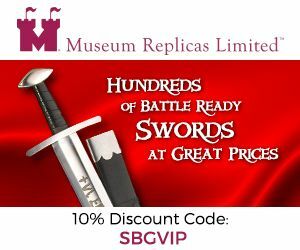 I've been really looking forward to getting my hands on this version of their 'Knights Templar sword'.. The sword arrived at my door in good heavy packing and bubble wrap and came with a good heavy coat of oil to protect the blade. After wiping down the blade, you can really see how attractive this sword truly is!! 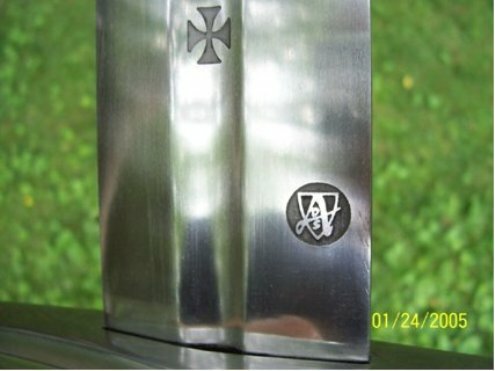 The sword is deeply etched across the blade on both sides and reads "MILITARIS TEMPLI" which is Latin for "KNIGHTS TEMPLAR". 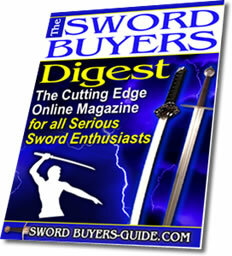 The sword also has the Darksword Armory trade mark at the base of the blade "DSA" in a round stamp - like all the swords they make come with. The handle is wrapped in black leather and very tightly wound.. The fittings of the guard has a high polish and stand out. The sword also comes with a nice scabbard - done in the same black leather as the hilt, and fits nice and snug in the sheath.. 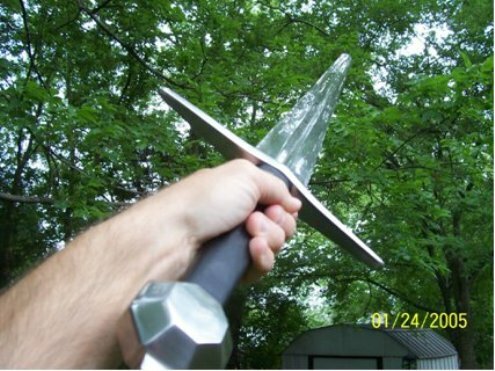 This is a true two handed sword and feels very good in your hands. It seems to have great balance and flows well with your swings. The balance point is about five inches from the cross guard. 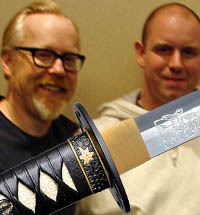 "For a heavy sword it handles very well..."
I had my local Knife sharpener put a razor's edge on the blade. 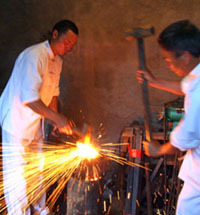 He said the swords' steel was of very high quality and the edge should last.. I was really looking forward to testing this bad boy Templar out. 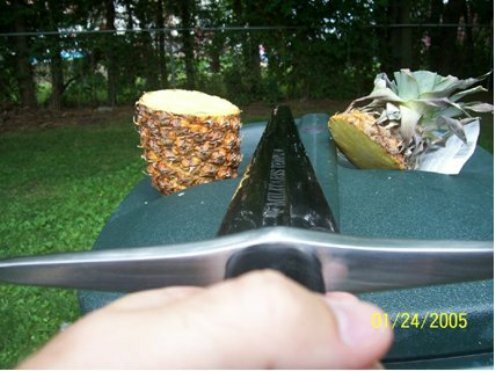 So I set up some fun tests in the back yard... First I started with a pineapple.. My first swing was at the top of the green leaves that stick up... Result - a nice clean cut..
Then I cut it in the middle and I hardly even felt the contact at all!! Another nice clean cut!! 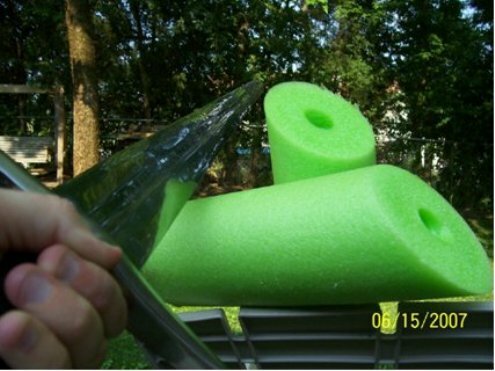 Test 2: A pool noodle, with a fast downward swing the noodle was cut very clean, as you can clearly see from the pictures below..
Test 3: I was able to cut 5 two litre milkjugs filled with water at once. My first cut was a bit off, but the second one nailed it. Test 4: 5 pumpkins in a row. It was hard to line up the shots, but when I hit them, they cut real good. What Can I say!??! This is a very nice sword!! 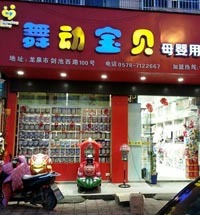 It's heavy and very well made. All the fittings are tight.. 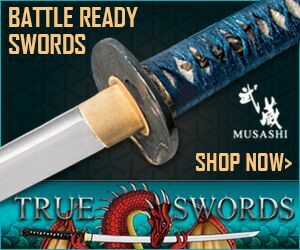 Even with out a sharp edge this sword would be ideal for sword practice or fairs.. 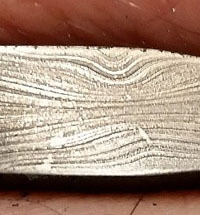 I may not sharpen the next one I get just for that reason. 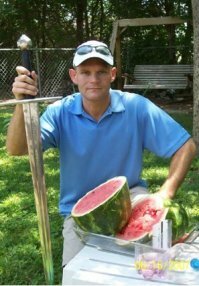 But this Knights Templar sword is sharp, strong and means business!! A true Templar! !